You all know that almost weekly I run giveways- that means a LOT of shipping! 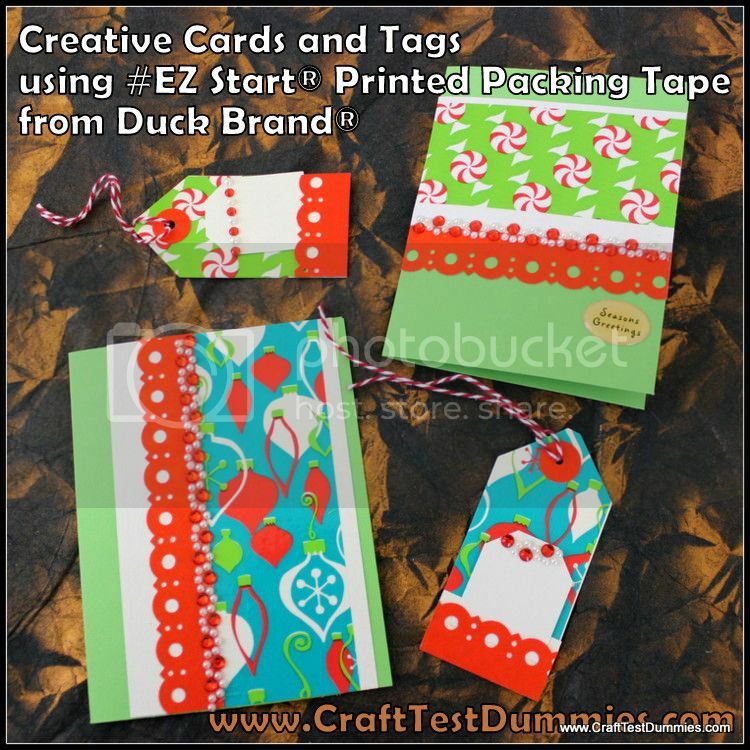 I use EZ Start Printed Packaging Tape from Duck Brand® to mail out my goodies. But did you know that they make PRINTED packing tape too? I’ve been using it for a while now. It’s just fun to get “happy mail” that looks…well…..HAPPY! 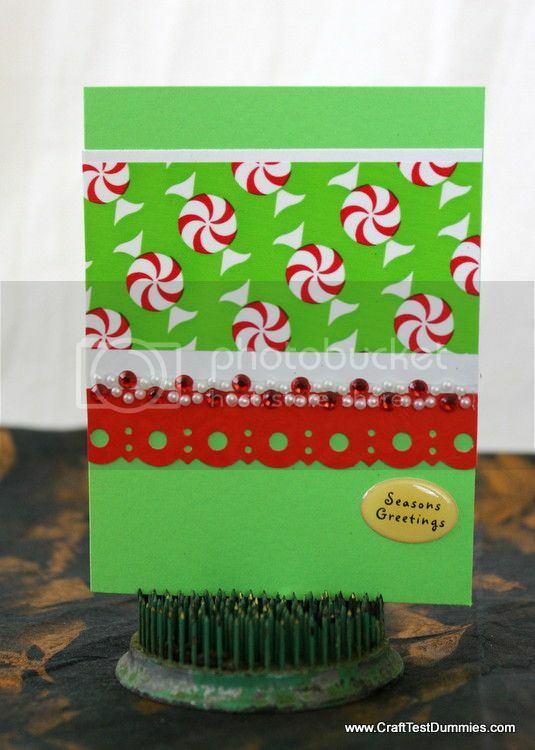 There are two special holiday designs this season- Peppermint and Ornaments. The nice folks at Duck Brand® asked me to come up with something fun and special to show off their tape. Since I need cute cards and tags to match those fun packages, I decided to create some festive cards. It’s OH so easy! 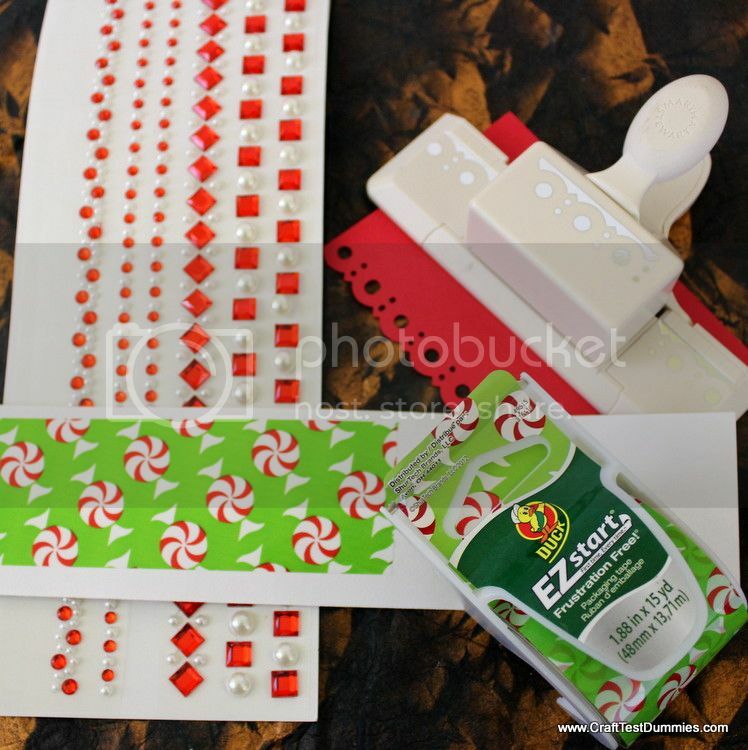 You’ll just need a card base (you pick the size you like), some scrap paper to coordinate with your EZ Start® Printed Packaging Tape, and some fancy scissors or border punch and maybe some rhinestone stickers! Oh, and some adhesive and string, too. Assembling the cards is easy! 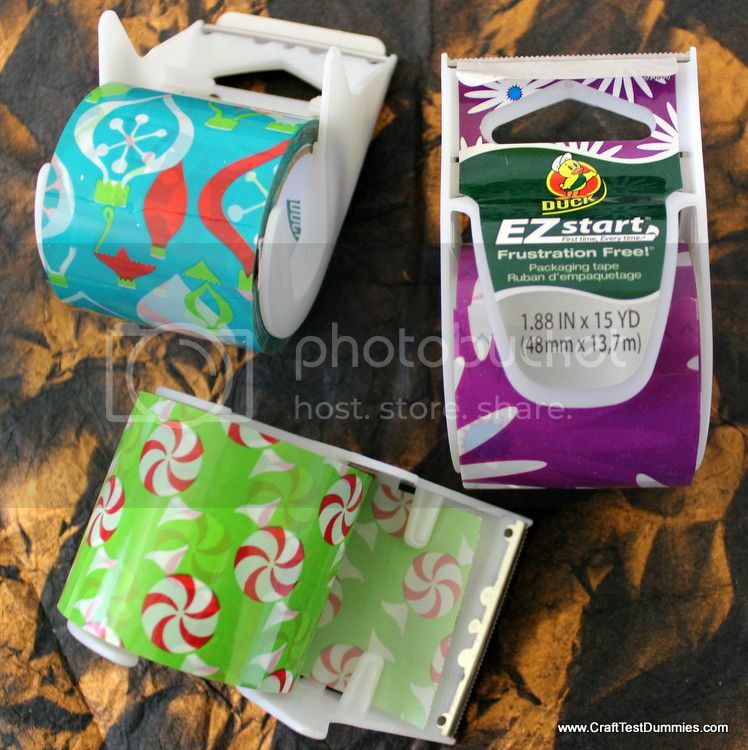 Just place your EZ Star®t Printed Packaging Tape on the white scrap paper, and trim to fit your card using scissors. Then add a strip of punched paper along the side. Mount both to the top of the card base and layer some rhinestone stickers on top! DONE! 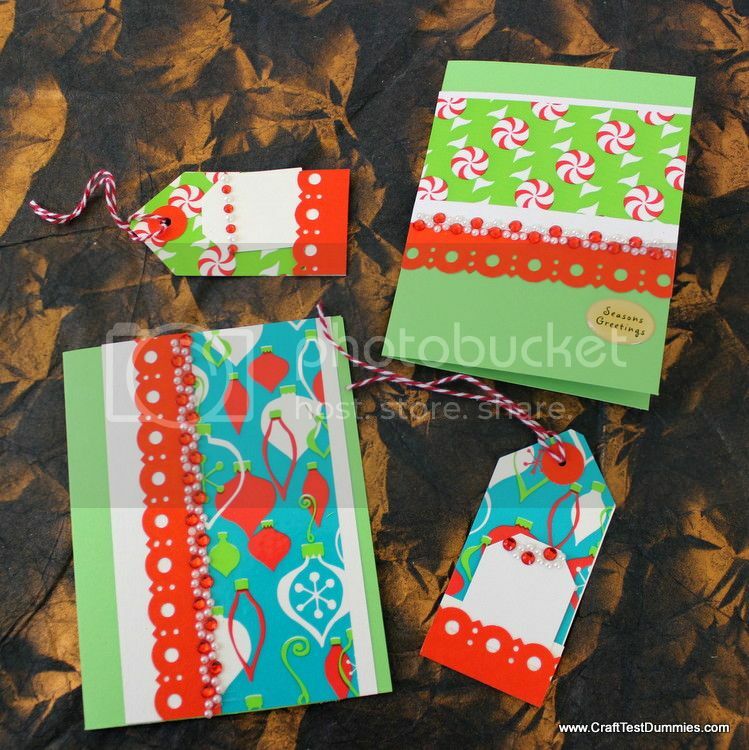 Now I can slip one of these cards or tags into the shipping boxes for a fun, festive and coordinated look! 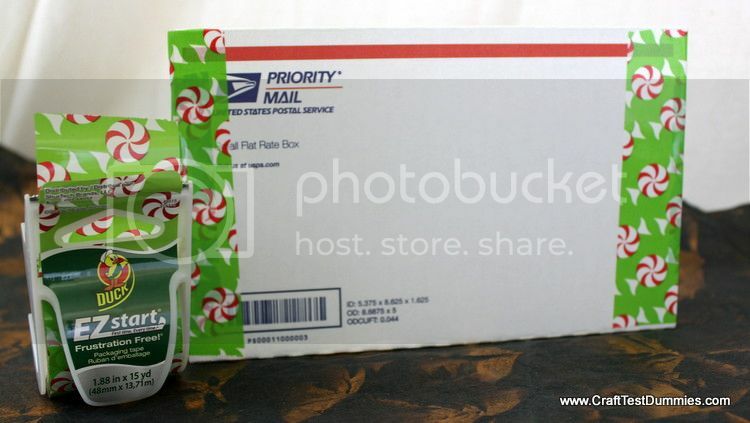 How would you use printed packing tape? I’d love to hear your comments! Never thought of using duck tape this way. Looks great and fast project. How I wish they sell any similar tape in Spain, shipping from USA is so expensive!!! Whenever I see any Duck tape ideas my teeth get really long and sharp with envy, ha, ha!!! I hope one of these years this brand will get to Europe, as it is so popular through internet crafters. These would make great envelope address wraps for the envelopes you make with the WRMK Envelope Punch Board. Thanks, Jenny!